"Unforgettably romantic. Exquisitely maintained. Simply elegant." 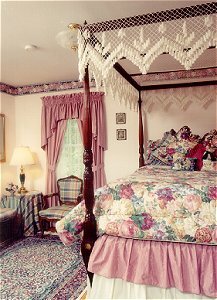 Welcome home to Colonial Gardens Bed & Breakfast. We are ideally located just a little over a mile from Colonial Williamsburg and five quiet blocks from the College of William and Mary on three acres of magnificent ancient oak, beech and poplar trees and award winning gardens. Our prime location in Williamsburg's finest residential neighborhood offers you a peaceful and relaxing stay. 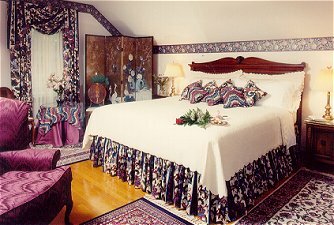 Each unique and beautifully appointed guest room or suite offers the finest linens, nightly turndown with hand poured chocolates, plush monogrammed robes, TV/VCR and phone, wine glasses and ice buckets. In the winter guests enjoy the cozy fireplaces in the suites. A choice of rooms with queen, king and canopy beds are available, all with ensuite bathrooms. Prices range from $125 to $165 a night and include a full breakfast. Packages and Gift Certificates are available. 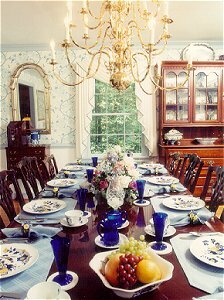 Members of the Bed and Breakfast Association of Virginia, Professional Association of Innkeepers International. This and other Williamsburg Bed and Breakfast Inns can be found here in The Register.